At CES Yahoo! anounced a new version of its instant messaging client. This is going to be more than just an updated version. It’s gonna be a completly new application specially designed for Windows Vista using WPF. 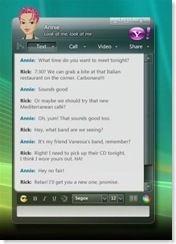 At the moment my famous IM client, for sure, is Windows Live Messenger. Why? Because it’s got a clear design and is not to clouded with all possible functions in any corner of the screen, a fact that is most certainly true for ICQ but to some extent also for AOL IM and Yahoo! Messenger. Anyway, Yahoo! Messenger is right behind WLM on second place. And with this new version (supposed it’s running stable and fast and won’t be cluttered with ads all over) it’ll be first place soon! The reasons are pretty straight forward: It’s got a nice design which fits quite well into my Windows Vista desktop but more important, it has a much clearer window structure, and most important it supports flexible chat windows tabs and the windows sidebar. With flexible window tabs, I mean it even has tabs (unlinke several other IM clients) and furthermore you’re not forced to decied between tabs or no tabs but instead just drag one window into another to "tab" them but still can leave certain windows untabbed. See, it really pays off to have a look at free, competitive products every now and then! Last but not least, I’m looking forward to the Vista Sidebar plugin. I’m checking the MS gadget gallery nearly every day for a similar Windows Live Messenger Plugin (there’s only two unstable ones). Currently I’m spending a few months in Spain, away from family and friends. Needless to say that there’s a few people I chat with quite a lot. 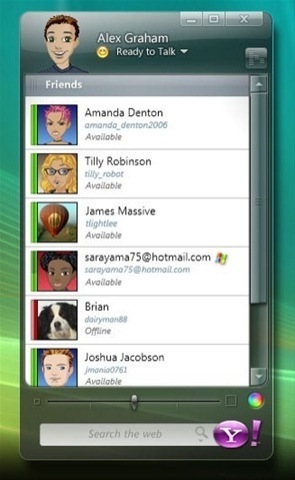 Let this be my partner, family members or people working with me on the same project, I’d be happy to have some sidebar gadget giving quick access to instant messaging with those people. I just hope hope Yahoo! will realese some early customer pre pre preview alpha version soon! Btw: I’m not a Yahoo! fan or something like that, but if this thing turns out to be only half as good as the video suggest, I’m gonna love it! 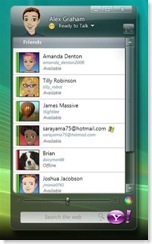 PS: Tabbed windows, a sidebar gadget, better background design and less restrictive message length limits would be a nice starting point for Microsofts next version of Windows Live Messenger. Closer cooperation with Yahoo! 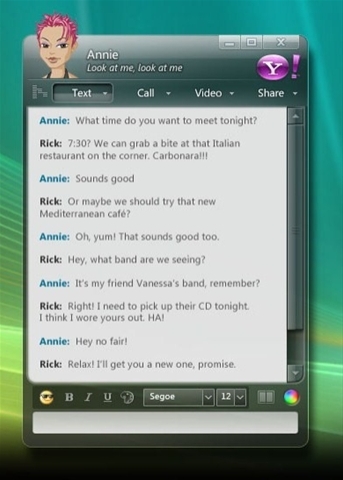 enabling inter-network video and phone talks would be another nice feature. About ICQ, … well, let’s just strip it down to the design part. That should be hard enough for you guys! As soon as you got a design at all, and by saying design, I MEAN design, start thinking about functionality and usability!